Are you planning your 2019-20 professional learning? The Leaders Professional Learning Program (LPLP) provides a unique and innovative approach to professional learning for Montana school leaders by offering an opportunity for participants to receive student-focused, solution-based professional development designed to be responsive to the challenges and issues administrators face each day. personal learning networks, including the option of one-on-one coaching/mentoring with experienced Providers. Tailored to meet the needs of administrators, learning networks meet both virtually and face-to-face allowing participants to share challenges, successes, and thought leadership with like-minded Montana leaders experiencing similar job roles, situations, and context while bringing professional development to the administrator. 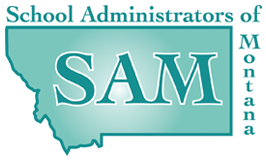 The goal of the SAM LPLP is to provide intentional, personalized professional learning to Montana educators through research-based strategies resulting in improvements in job satisfaction, administrator longevity, and ultimately to increased student achievement and quality of instruction which will positively impact the education of students across Montana. Click HERE to listen to Daisy Dyer Duerr's podcast, "Mentoring in Rural Montana", featuring Godfrey Saunders discussing the SAM LPLP program. Thank you to our SAM LPLP Valued Sponsors!